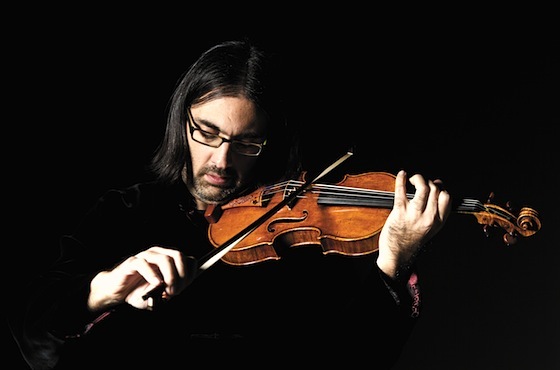 Leonidas Kavakos performed three Brahms sonatas in recital with pianist Yuja Wang. The Telegraph: "He has a naturally noble sound, thanks to his fabulous bow control which can sustain an even unblemished line from tip to heel. It felt exactly right for Brahms, whose own control over his musical materials was equally iron. And in the slow movements, where Brahms relaxes and indulges his taste for rich sonorities, Kavakos’s clean, pure line kept sentimentality at bay." Isabelle Faust performed the Britten with the San Francisco Symphony. San Francisco Chronicle: "Faust give the piece a thin, laborious reading, in which mournful respect was replaced by grim hectoring." San Francisco Classical Voice: "Her performance and technique were as striking as her bright red, serape-like blouse that evoked the spirit of Iberia." Examiner.com: "Britten’s concerto is as technically demanding as it is intensely expressive. Fortunately, Faust approached the concerto with a solid command of technique (as solid as the technical dexterity she brought to her recording of the Berg concerto). Equally, important was her chemistry with Denève, responsible for providing her with a context based on Britten’s deep understanding of every instrument in a full orchestra." Simon Michal performed Mozart's Violin Concerto No. 3 with the Juilliard Orchestra. The New York Times: "Czech violinist Simon Michal played with freedom and deep tone. It was a little fussy at times, but his nonchalance and ability to shape a phrase suggested a talent we will hear more from." Pinchas Zukerman performed the Beethoven with the IRIS Orchestra. The Commercial Appeal: "His performance of Beethoven’s Violin Concerto in D major was a testament to the ways virtuosity can be expressed." Valeriy Sokolov performed Bartok's Second Violin Concerto with the Ulster Orchestra. Belfast Telegraph: "Intense, vibrant, technically superb, Sokolov exploited every nuance of genius in Bartok's music." So-Ock Kim performed the Mendelssohn with the York Guildhall Orchestra. The Press: "So-Ock Kim is not your typical violin virtuoso. She has all the ammunition, but she spurns fireworks for their own sake. So her account of the concerto was off the beaten track – and all the more refreshing for that." Laurence Jackson performed the Bruch with the City of Birmingham Symphony Orchestra. Birmingham Post: "It was a performance of grace and good taste – a little too much of the latter perhaps."